On 9 June 1572, Jeanne d’Albret, the queen of Navarre died. Navarre was a small, Pyrenean kingdom, nestled between France and Spain, and fiercely holding on to its independence in the face of these two great powers. Jeanne was born at Saint-Germain-en-Laye in France on 16 November 1528 and was a relation of the French royal family through her mother, the sister of François I. Her husband, Antoine de Bourbon, was a prince of the blood and spent most of his life torn between his conflicting loyalties to France and Navarre. Jeanne inherited the throne from her father, Henri II in 1555. 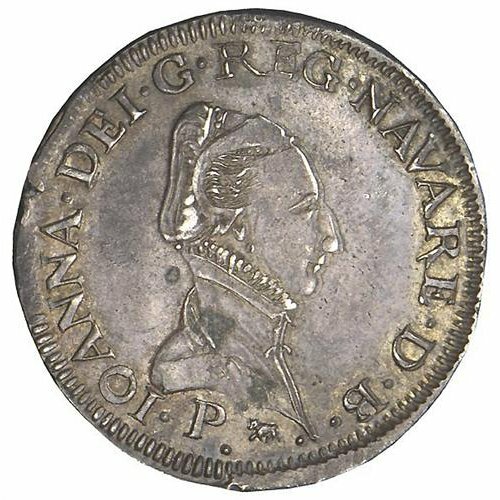 She had been raised a Huguenot (French Calvinist Protestant) and on her accession, declared Protestantism the official religion of Navarre. She was very clever and a shrewd politician. She was well educated and, taking after her mother, Marguerite of Navarre, she was a writer. Jeanne composed and published numerous poems. 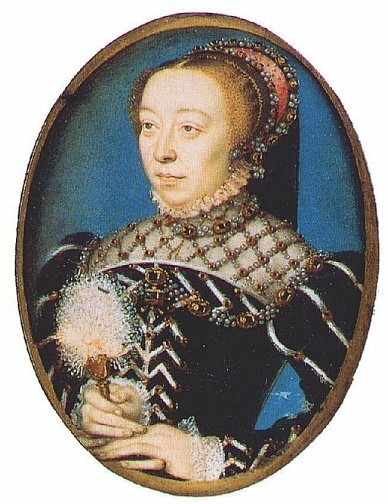 Pious and staunchly Protestant, Jeanne was suspicious when, in 1570, plans were formed to marry her son and heir, Henri de Navarre, to Marguerite de Valois (Margot), the daughter of Henri II of France and Catherine de’ Medici. Catherine hoped to bring peace to France, which was again on the brink of a religious civil war, with the wedding. Jeanne suspected a trap but was keen to see her son make such an advantageous marriage. Two months before the marriage was scheduled to take place, Jeanne died suddenly in Paris. Rumour was rife that Catherine de’ Medici had had her poisoned. Shortly before her death, Jeanne had supposedly received a gift of scented gloves from Catherine’s infamous perfumier, René the Florentine. René was famed for his Italian perfumes and cosmetics, but widely suspected of being the maker of the poisons the queen mother allegedly used to dispatch her enemies. The marriage went ahead on 18 August 1572, with horrific consequences. This entry was posted in Henri de Navarre, Infamous Women, Jeanne d'Albret, Marguerite of Navarre and tagged Catherine de' Medici, France, henri de navarre, history, History of Europe on June 9, 2011 by Gillian. 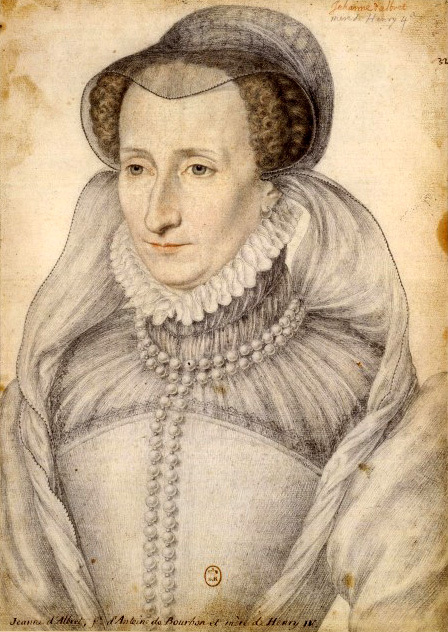 On 5th January 1589, Catherine de’ Medici, the Queen Mother of France died at Blois, possibly of pleurisy. She was 69 years old and had spent the last thirty years fighting to keep the French throne in the hands of her sons, three of whom succeeded their father, Catherine’s husband Henri II, to be king of France. Catherine had arrived in France from her native Italy in 1534. Pope Clement VII (who famously refused to give Henry VIII his divorce from Catherine of Aragon), her uncle, had used his wealth and power to arrange a most illustrious marriage for her. She was descended from the Medici family but though they had been important in Florence, bankers could rarely expect to marry princes. However, Francis I of France had depleted his treasury in the pursuit of land and glory the Italian Wars and the handsome dowry which Clement promised to send with Catherine, along with an alliance with the Pope, meant that Francis was willing to overlook Catherine’s less-than-ideal pedigree. That said, Catherine did have a small amount of royal blood. Her mother, Madeleine was related, fairly distantly, to the French crown. Sadly for Catherine, she never knew Madeleine as she had died only a few days after her daughter’s birth. It is thought that she had contracted syphilis from her womanising husband Lorenzo. Within a couple of weeks, he too succumbed and Catherine was left an orphan. The young girl was raised initially in Florence with relatives and later in Rome, under the care of her uncle the Pope. She was intelligent, witty and lively but never described as a great beauty. Luckily for her, her family wealth and influence would go some way towards making up for such a defect. Many female failings could be compensated for with a heavy enough purse. Various matches were suggested for Catherine but it was the one with Francis I’s second son, Henri Duc d’Orleans, which went to fruition. As the second son, Henri was not expected to become king and so Francis was content to marry him off to the banking heiress. Aged 14, Catherine set sail for France and was welcomed to Marseilles with great festivity. Soon after her arrival she and Henri married in a lavish ceremony. Henri was a withdrawn youth, scarred by his time as a hostage in Spain. He proved to be a polite and dutiful husband but his affection lay with his long-term mistress, the vampish Diane de Poitiers. Though Henri was distant and disinterested in his plain little wife, Catherine adored him. Predictably enough, the marriage was troubled and Catherine and Henri’s lack of heir compounded the problem, especially after Henri’s elder brother died making him next in line to the throne. Catherine was in danger of being repudiated and replaced with a more fertile wife (the assumption being that infertility was the woman’s “fault,” particularly after at least two of Henri’s mistresses gave birth to his children. 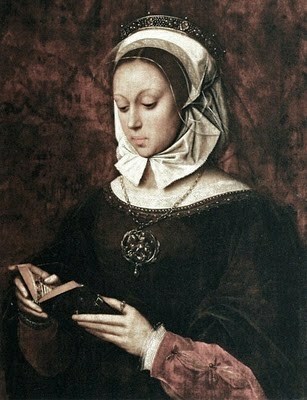 Catherine reputedly tried all manner of superstitious solutions to her infertility. Eventually, after some medical intervention (the exact nature of which is shrouded in mystery), Catherine finally conceived after ten years of fruitless marriage. She went on to produce ten children in the following ten years, of whom three daughters and four sons survived infancy. Of those sons, three would become king of France. As dauphine and then queen, mother to the heirs of France, Catherine still enjoyed all but no influence over her beloved husband. Instead, Henri discussed matters of state with Diane and it was with her that wise courtiers curried favour, not the dowdy foreign queen. Diane even encouraged Henri to visit his wife’s chambers in order to have more children with her but after the delivery of twin girls (both of whom died) in 1556 almost cost Catherine her life, she was advised not to attempt to bear more children. Henri therefore never slept with her again. In 1559 tragedy struck when Henri was injured in a joust. His opponent’s lance shattered on his visor, sending shards through the king’s eye. After several days of agony, Henri died with Catherine at his side. Catherine took her revenge on Diane by barring her from attending to Henri as he lay dying, calling for his mistress. She then ordered that Diane was to return all the jewels that Henri had given her during their long relationship, claiming that they were crown jewels and not Diane’s to keep. She then banished her from court. Unfortunately for the queen, her grief (for the rest of her life she rarely wore any colour other than black) and desire to extract a petty revenge caused her to miss the more important opportunity which had presented itself. Her eldest son Francis had acceded to the throne on Henri’s death. As Francis was only fifteen years old, a regent had to be appointed. Typically, the Queen Mother would take on this role however Francis was married to Mary, Queen of Scots, and it was Mary’s uncles who held the real power and Catherine was regent in name only. Francis was crowned at Rheims as was customary but within eighteen months he too was dead after an ear infection led to an abscess in his brain. He was succeeded by his younger brother who became Charles IX. Catherine was not to let this opportunity slip through her fingers. The Guises held no particular power over Charles and Catherine took the reins of government on herself, finally able to exercise some power. During Charles’s minority and beyond, Catherine strove to reconcile the Catholics and Huguenots (French Protestants) and avoid civil war. Catherine was pragmatic on matters of religion and hoped to achieve an accord by extending toleration to Protestants while maintaining the support of the powerful Catholic factions. Despite her efforts, antagonism on both sides spiralled out of control and France was torn apart by thirty-six years of on and off civil war. 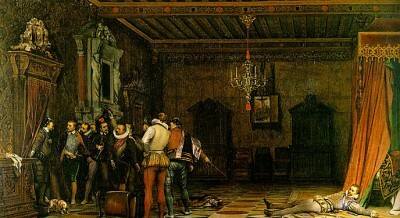 The nadir of Catherine’s period of power was the St Bartholomew’s Day Massacre which began on 23 August 1572 and led to the murder of thousands of Huguenots. 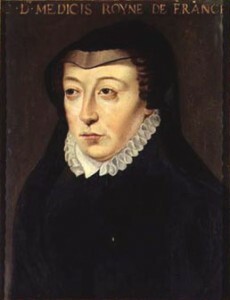 The Massacre followed the marriage of Catherine’s daughter Marguerite (known popularly as Margot) to Henri of Navarre, the Protestant king of Navarre. 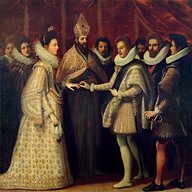 The marriage, of a prominent member of the Catholic ruling family, to Henri, a Prince of the Blood and a Calvinist, had been designed to unite the quarrelling factions and bring about it a lasting peace. It was not to be: another civil war followed. Charles IX died only two years after the massacre, reputedly driven almost mad with guilt. He was succeeded by his brother who styled himself Henri III. Although Henri was old enough to rule in his own right, Catherine retained a prominent position at court and Henri left her to deal with the business of ruling which did not interest him, preferring to devote himself to acts of conspicuous piety, such as flagellation. Though he married, like his brothers before him, he too failed to produce a male heir. The throne to which Catherine had held on so tightly was slipping from their grasp. When Catherine’s youngest son, the duc d’Alençon, the heir apparent, died before his thirtieth birthday, Henri was forced to name his brother-in-law Henri of Navarre as his successor. The Guises, horrified at the prospect of a Protestant king, rallied their men and took control of Paris. Henri, under Catherine’s advice, fled the city for Blois to regroup. There, he summoned the duc de Guise. It was a trap and on his entrance to the king’s chambers, Guise was set upon by the guard. Catherine knew nothing of Henri’s plan and on discovering what had happened, knew that Henri’s days too were numbered. Less than a fortnight later, Catherine herself died at Blois. She did not live to see her favourite son murdered and Henri of Navarre’s eventual succession to the throne as Henri IV. He later divorced Margot and remarried and so none of his successors carried Catherine’s blood, nor that of her beloved Henri. It was Henri IV though who brought about the peace which Catherine had tried so hard to effect. This entry was posted in Catherine de Medicis, Diane de Poitiers, Henri de Navarre, Infamous Women and tagged anniversary, Catherine de' Medici, Diane de Poitiers, France, henri de navarre, history, History of Europe, Loire, mistresses, postaweek2011 on January 5, 2011 by Gillian.